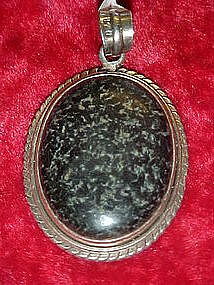 Nice large pendant set in sterling silver, Looks like a granite of sorts, I don't know much about these natural stones. Measures 1 3/4" x 1 1/4". Nice condition, but no chain. Slide marked 925 (look closely in photo) Email me if you need to see a photo of the back.